You’ve started with a product and now you’re trying to attract investors, draw an audience, and most importantly, build a brand. But brands today aren’t about products; they’re about stories. They reflect our personal worlds. 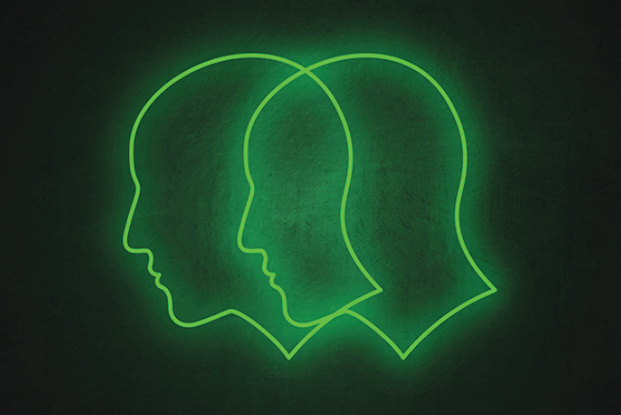 They become extensions of our identities and markers of where we belong and what we stand for. And like all great stories, the brands that strike deepest — and stick around longest — are the ones that are crafted to inspire. Apple isn’t selling computers and smartphones; they’re inspiring simplicity and creative freedom. Adidas isn’t pushing athletic gear and apparel; they’re inspiring style, comfort, and competition. 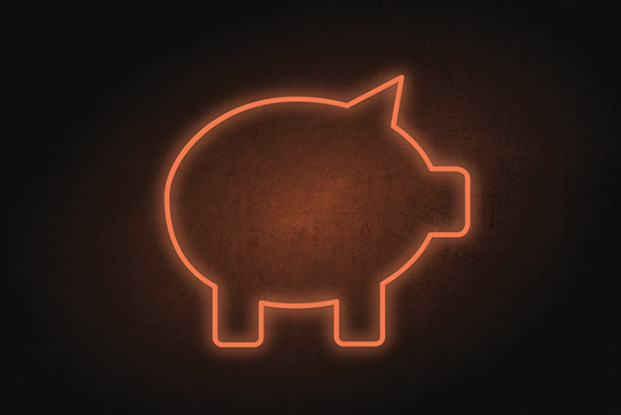 Brands that inspire spark consumers to aspire — inviting them to invest not just in a product, but in a quality. A way of life. A story they can become part of. So when considering what story your brand should tell, consider the validations of an inspirational approach. Innovation is the root of all inspiration. When your brand stands for more than a product and quarterly sales, but on an ethos consumers can connect with — those ‘consumers’ become supporters you’ll learn and grow from. And when you’re solving their problems and sharing their goals and values, they become investors in your success. Take cosmetics brand Nubian Heritage, which started making beauty products drawn from traditional African remedies in Harlem circa 1992. Their passion for sharing their black soap and shea butter products — and the cultures they came from — resonated strongly with their supporters, who in-turn demanded and inspired more (and more diverse) products. When inspiration is the underpinning force of what you do, you can devote time and resources to innovative new approaches and a more meaningful dialogue with your audience. Let them see how your story is their story — and your brand will become theirs, too. Inspiration attracts and retains better talent. Top talent is notoriously difficult to find and keep, particularly in a brand’s early stages when top salaries are harder to compete with. But inspiration is more than a tool for connecting with consumers; it often draws the best and brightest in search of work they believe in. 3M is a 115-year-old manufacturing company, but it recently rocketed to the top of the most sought-after workplaces for Millennials. Best-known for its adhesive products — like Scotch tape and Post-its — 3M shifted its brand strategy with an ‘Applied to Life’ campaign in 2015, creating short videos that showcased the positive and widespread impact those products make around the world. Now when 3M appears at tech conferences and college campuses, they’re hugely popular with STEM workers wanting to use their science skills to affect change. When your purpose is more important than your bottom line, you inspire and attract employees who measure their own worth beyond the dollar signs — and who’ll stick around as you grow together. A few years back, the beloved micro-blogging platform Tumblr was bought for a massive $1.1 billion, in part because it had amassed 550 million monthly users and 130 billion monthly posts, but mostly for having inspired a generation of creative meme-ers that generate consistent revenue. Similarly, Snapchat was recently valued at $25 billion after inspiring millions of amateurs to become storytellers and self-publicists — making the platform utterly indispensable in turn. A brand that inspires doesn’t have ‘users’ — it has fans. Fans who become ambassadors for that brand, spreading the word and recruiting other fans. That’s what today’s investors are looking for: an inspired and self-perpetuating consumer base that generates loyalty and longevity. Inspiration creates brands with legacies. Founder and former C.E.O. of Whole Foods, John Mackey, didn’t grow a company with nearly 500 stores and 87,000 employees with better-tasting or definitively higher-quality products. He branded his company as one that is ‘ethical’ across all of its supply chains, inspiring a generation of eaters to reconsider how they eat. As we’ve suggested throughout, it’s the why — the story — the inspiration behind a brand that draws consumer trust, employee retention, and market growth. And it’s a bottomless well. Continuing to invest in inspiration over time is like reinvesting dividends back into a company you believe in, which in turn draws more and more investment (and $). Take a look at your favorite brands and you’ll likely find something in common across all of them. They’re not your favorites for the things they sell, they’re your favorite for the things they stand for — and what that means to you and the world you want to live in. That’s inspiration. It can apply to virtually any good or service you can imagine. But invest now and its value might just surpass the imaginable. According to Michelangelo, sculpting David was simple. All he did was chip away the bits that weren’t David. Brands can benefit from the same approach - stripping a brand back to its very essence can help articulate its core qualities in a way that’s real, honest and simple. 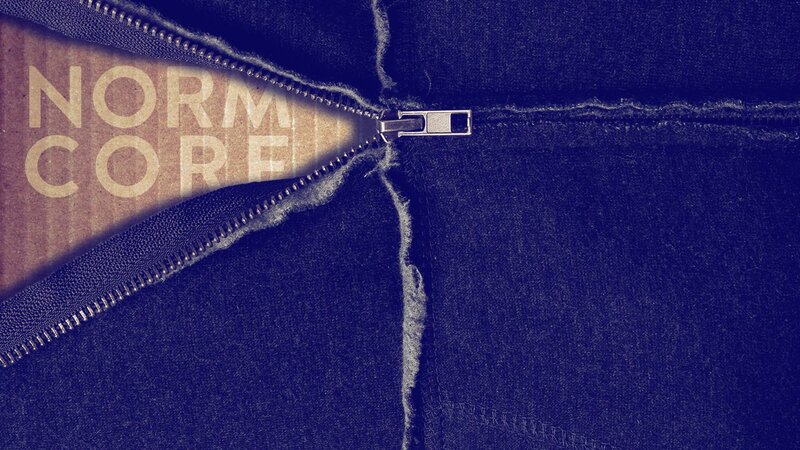 It’s an approach known as ‘debranding’, and it’s a much-needed response to brand fatigue. Our world is loud enough as it is. By dialing back the volume on our branding efforts we can craft identities that speak honestly and meaningfully - without having to shout. Because as it turns out, a little bit of branding can go a long way. No one wants to be a walking ad. 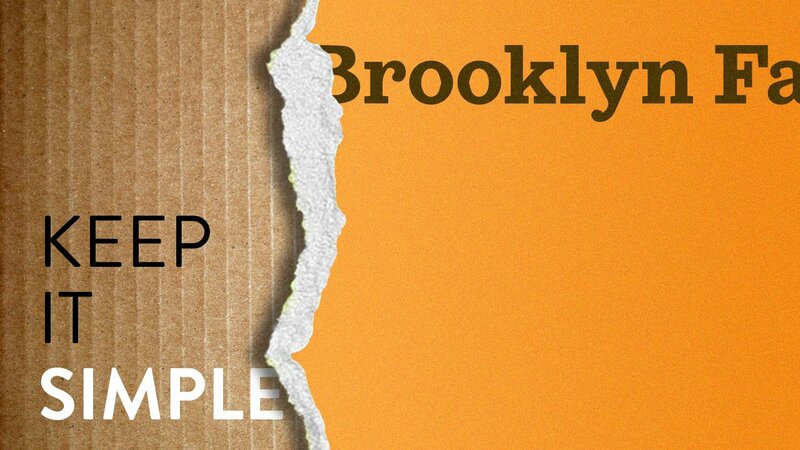 Recently an anti-fashion movement sprang up among Brooklynite youth: ‘normcore’. Characterized by bland, nondescript attire, it was fashion’s answer to vehicular debadging. It wasn’t really about the clothing. It was more of an attitude. It was about wanting to be something other than a clotheshorse for corporate logos or a participant in the trend du jour of the advertising powers-that-be. It embodied the rumblings of concern and mistrust that occur in a world of huge, faceless monolithic companies – behemoths whose day-to-day workings and practices are impossible for consumers to identify and assess. Today’s consumers necessarily want to support big business – and nor do they want to be a walking advertisement for the products they choose to invest in. They’re looking for a more personal connection. The power dynamic has flipped. Rather than consumers proving themselves worthy of being a brand’s ambassador, a brand now has to prove itself worthy of its customers. Consumers want to opt in to a product, not be shouted into using it. Brands don't need to go all out. Rolling back the visual assault of a highly branded identity has been the solution for some of the usual suspects. 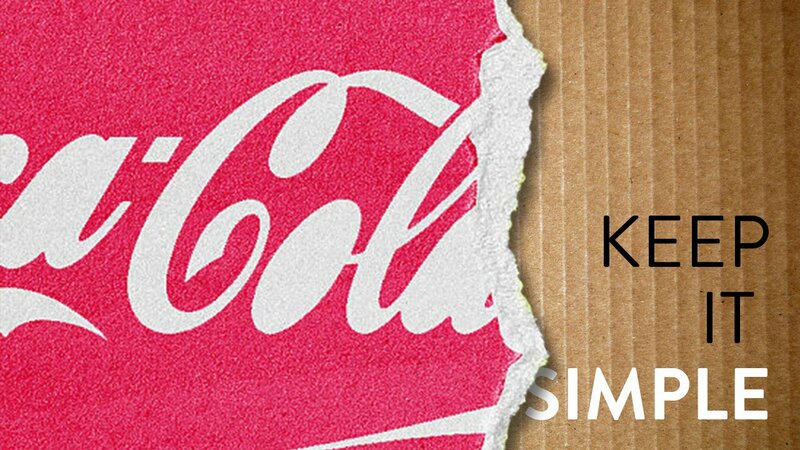 Take Nike, Coke, Shell, and even Starbucks, all of which have pared back their brandmarks or packaging – achieving greater impact as a result. Not everyone has this kind of existing brand equity to tap into, but that’s not necessarily a bad thing. New brands don’t have to worry about having to unravel years of big corporate connotations and the baggage of globally recognizable visual identities. They can enter the market with the unassuming charm of a “little guy”. Brands such as Justin’s Nut Butter and The Originals keep things simple, with understated packaging and purely descriptive product names. They don’t need to make big claims about what they are or aren’t, because their they’re so honest and straightforward that the advertising machinations we’d expect from other companies haven’t even crossed their minds. Brilliant, isn’t it? We know when brands are pulling a fast one. Using debranding to convey authenticity is one way of catching the eye of customers who have decided to step outside the all-pervasive ecosystem of the major conglomerates. 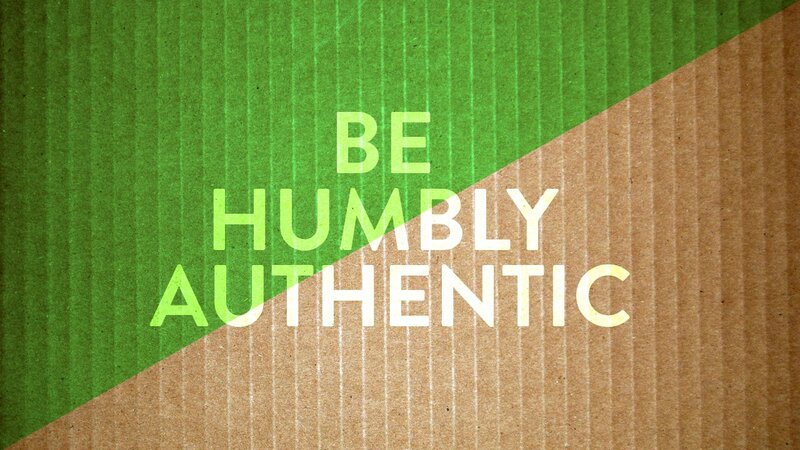 But if you’re going to play the humbly authentic card, you have to be humbly authentic. When the Harris+Hoole cafes beloved by UK hipsters were revealed as being backed by mega supermarket chain Tesco’s, public sentiment plummeted. It wasn’t Tesco’s itself that was at fault, but rather the perceived deception. Oregon’s beloved boutique 10 Barrel Brewing similarly made waves a couple of years back. Even though nothing about its products had changed, consumers were aghast to hear that the brand had been acquired by Anheiser-Busch InBev – the multinational owner of all things Bud. Of course, taking your debranding all the way back to the anonymously generic has its risks, too. Google can reduce its logo to a series of colorful dots and still be recognizable, but a lesser-known brand runs the risk of becoming invisible. In these cases, context and distribution can be key. 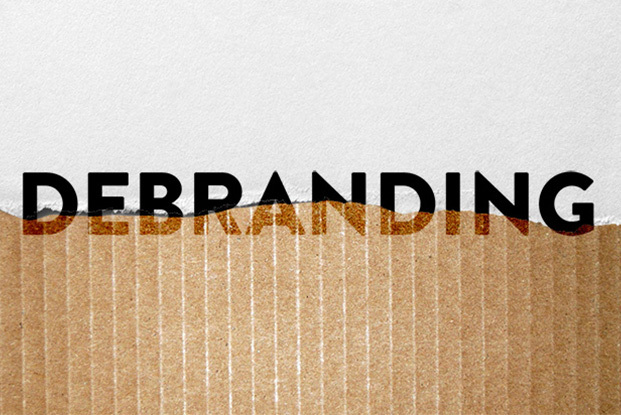 Debranding doesn’t have to mean unbranding. Think of it more as a decluttering of a visual identity. The marketing equivalent of Coco Chanel’s advice about taking off one accessory or item of clothing before leaving the house. A debranded brand can be a sight for sore, over-stimulated eyes. It’s a gracious move – one that indicates that the brand values the consumer over its own needs. New York’s Brooklyn Fare, for example, has crafted a memorable, fun identity using nothing but quirky copy typed in a simple serif font on one-color backgrounds. Even the website is refreshingly text-only. In a world of increasing visual noise debranding can create a haven of sorts. By artfully distilling a brand essence down to its core and communicating it in a simple, minimalist fashion – whether through identity or strategy – brands get to play with the power of suggestion. And consumers get to choose whether to be a part of it. Debranding isn’t for everyone. It requires a certain degree of existing brand equity and a deep awareness of how customers respond to a given brand or product. But brands should be far less concerned about how loudly they’re shouting – and far more about what they’re actually communicating. After all, even Michelangelo’s David wouldn’t be David if he hadn’t been stripped back to the basics. Design is art with function: it’s elegantly purposeful. By applying design thinking to creativity, you can create things that make a meaningful difference in the world – and that are specifically crafted for an audience who truly wants them. When you apply that same kind of thinking to business, you get results that go beyond ideas and into the realm of the viable. 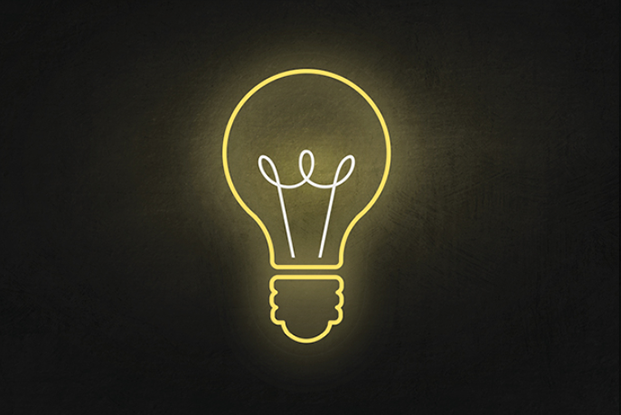 There’s nothing wrong with innovation for innovation’s sake. But the problem comes when you try to grow a business out of something that doesn’t really need to exist. Design thinking reduces this risk – it’s a kind of idea insurance. The fundamental benefit of design thinking is that it ensures that you’re creating things that people actually want. Are you making something people want? 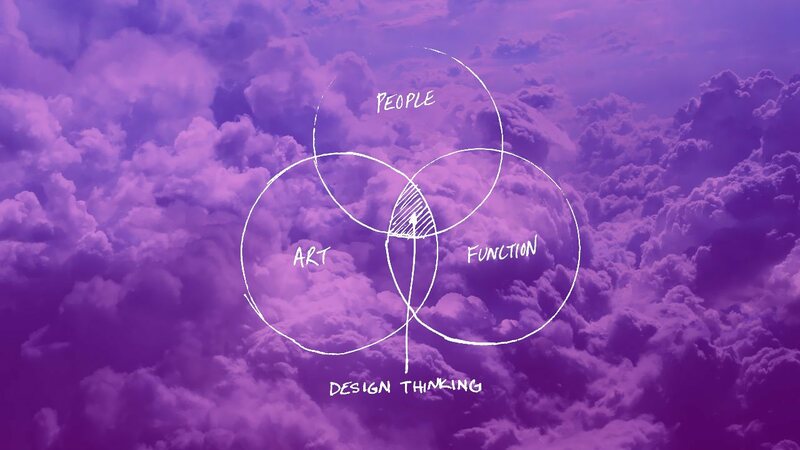 At its core, design thinking is a framework for invention built around a core question. Why does the thing you’re doing or making need to exist? It’s a deceptively simple question. But a lot goes into answering it completely. You need an understanding of the world and its limitations – and an understanding of the people in it and their limitations. When you overlay the two and find a gap, you’ve found a place that’s crying out for a solution. Take the team collaboration platform Slack. It may seem like just a chat room, but there’s a reason it has 3 million daily users and a market valuation of $3.8 billion. Slack successfully identified a gap in how teams communicate while at work – those endless email chains and task-logging programs just weren’t doing the job. But Slack’s product does. It’s been crafted to improve intra- and inter-office communication and collaboration – which is what people had been clamoring for. Design thinking creates successful brands. The great thing about frameworks is that they’re translatable, transferable and scalable. The same design thinking approach used to develop a marketable product can be used in developing your business. It makes sense, after all – your products arise from the environment that created them. They’re the result of your business, and your business is the result of your products. It’s a symbiotic kind of relationship. The two go hand in hand, building and growing each other. All organizations are unique entities with their own philosophies and identities. Some identify these organically over the years, while others efficiently and industriously craft theirs from the get-go. The latter type are the design thinkers. The ones who understand the purpose and function of what they’re putting out into the world – and who build a brand accordingly. And the outcome is a brand that builds back. Let’s take The James and Ace hotels. Their dramatic expansion into the boutique hospitality market isn’t just luck and happenstance. Their artfully chosen locations, thematically unified decor and signature amenities result in the provision of a very particular experience being sought after by their savvy guests. They’re offering an experience by design – and that experience gives back to the company through the reiteration of its brand. Design is used from concept through to execution to craft a set of consumer expectations – and to ensure that they’re not only met, but met consistently. Because once a brand promise has been broken, that trust is gone. But when you have the support of design, those brand promises will be so deeply embedded in your organization that it won’t even be possible to break them if you tried. Design thinking lets you scale and adapt. Design as it relates to visual identity is easy enough to conceptualize. But for businesses that are built entirely upon a foundation of design, the result is far more than just looks – instead, we’re talking about the intersection of form, function and philosophy. And when your organization is artfully positioned in the middle of this Venn diagram, you can re-evaluate, refine or even redefine what you stand for, what you do, and how you present it. A business predicated on design thinking is always reflecting on the function and purpose of what it’s putting out into the market. It’s always asking whether it’s making what people actually want. And as the needs of the market change, the business changes, too. 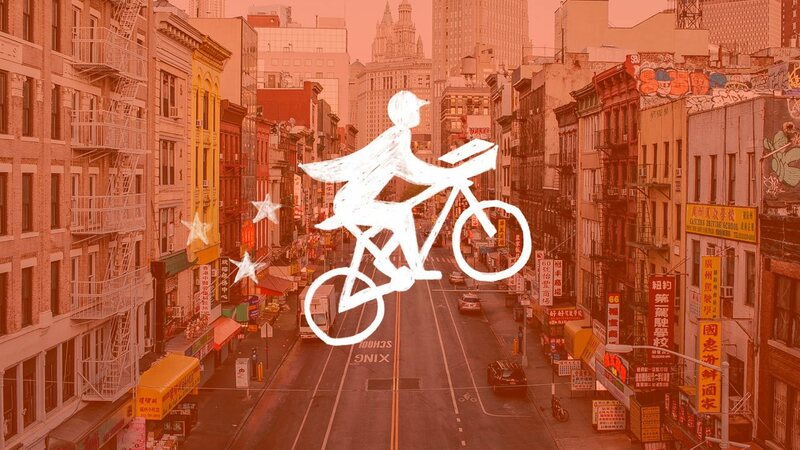 Take peer-to-peer delivery service Postmates as an example. When it launched amidst a crowded field of competitors in 2011, naysayers were bearish about its longevity. But the company’s offering – efficient delivery at the lowest possible price – was designed precisely with the market’s needs in mind. And it has continued to evolve as the market has, offering the new “Plus” and “Unlimited” features as a way of meeting newly arising customer requirements. 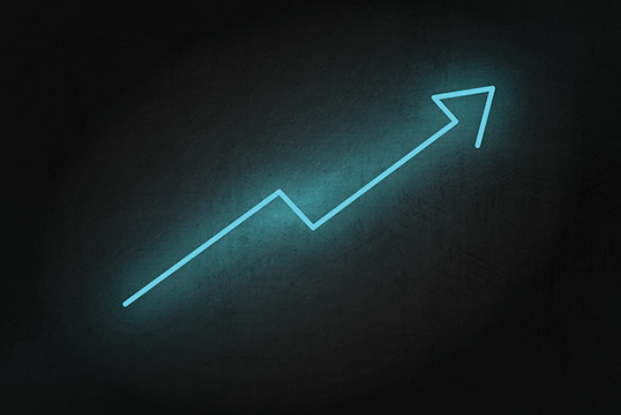 The upshot was improved vendor relationships, a larger customer base – and a business that continues to build an ever more sophisticated and granular response to an identified need. 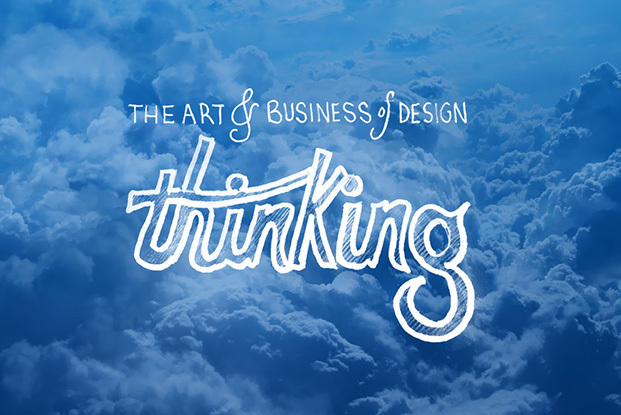 Every business deserves design thinking. Design is an act of creativity – but an elevated one. It walks the line between want and need, and fills gaps in our lives rather than trying to invent them. 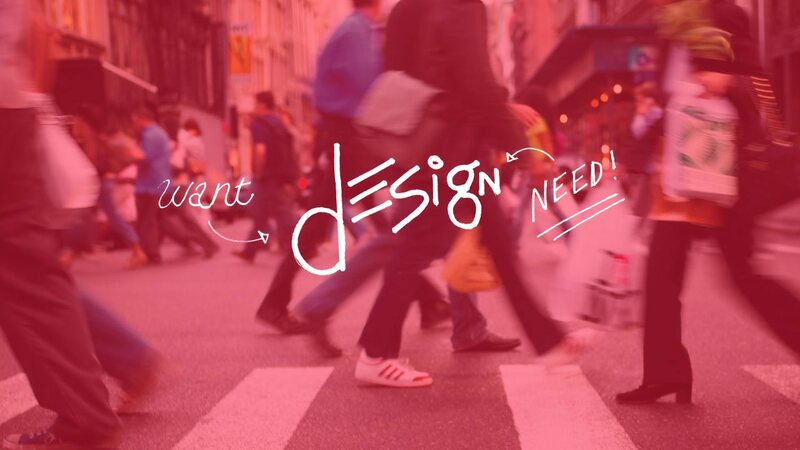 And when businesses begin to expand their notion of design beyond visual identity and into their underpinning identity and ethos, they’re perfectly positioned to fill those gaps by engineering useful, purposeful solutions to identified needs. When intelligent, thoughtful design provides the foundation for what you do, you no longer have to try to convince people to care about what it is you make or offer. Because your entire business model is all about making the things that people actually want. STARMEN is excited to announce we’ve received a pair of Summit Creative Awards for two unique client endeavors. Our website work garnered both a Bronze and a Silver from SCA's recent cycle. Both of these respective projects encompassed elements of both brand strategy and web design and development, and we’re proud of what we were able to accomplish on behalf of these clients. Fueled by a tenacious creative energy, our work as an agency is appraised first and foremost by our clients’ satisfaction. That being said, it is always an added bonus to have our projects well-received by judging panels as this kind of recognition not only validates our clients’ visions, but helps hold our team to a higher standard of design and branding excellence set by the world’s leading industry experts. 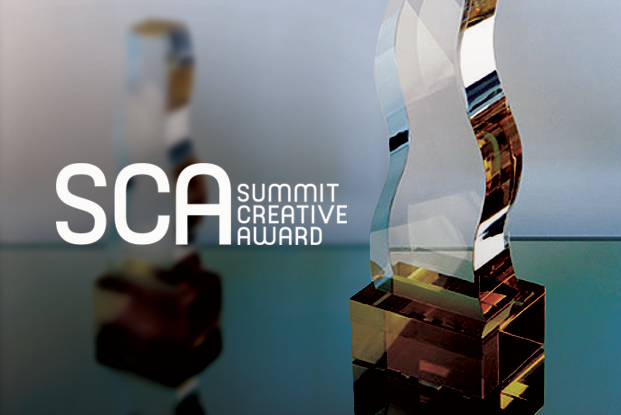 "Since 1994, the Summit Creative Award has enabled creative firms to receive the recognition they have long deserved. 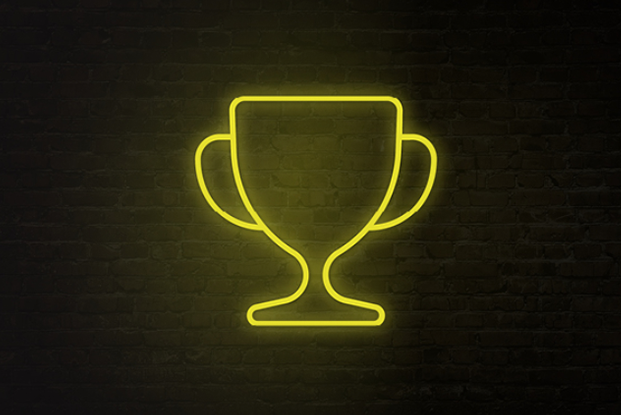 This international advertising competition offers participants a unique opportunity to showcase their talents alongside similarly positioned agencies, and to have their work judged by experts in the advertising field. Our exclusive award-selection process means winners have earned the right to broadcast their achievements far and wide." Since 1994, the SCAs have sought “to laud the creative work of less-than-huge SCA Logo agencies, making competition affordable and accessible.” Many other organizations seemingly lean in favor of bigger agencies with bigger allowances, and this sometimes presents insurmountable opposition for smaller ventures competing in the same categories. However, the SCAs seek to honor great work regardless of budget. The SCAs are the first and most prestigious competition of its kind, and submissions hail from all corners of the globe. One thing’s for certain, though. The Summit Creative Awards serve as proof that sometimes the most captivating work is roused from the most stringent of finances, when lack of fiscal freedom forces creative and development teams to think outside of the box to find solutions that are both groundbreaking and financially conservative. There is indeed something very noble about an agency’s ability to create something spectacular from something very small. As an agency, we’re proud to give our clients the vocal and visual brand presence needed to be heard in today’s cluttered marketplace. The most powerful expressions of creativity are the ones that effectively communicate to audiences outside ourselves, and our ability to collaborate and create with others is what sets us apart from other species in a world that’s constantly in a state of change. But what does that mean? And what is the root of the nature of creativity? The origins, meanings and execution of creativity is something that’s been hotly debated since the dawn of time. The only thing that seems certain is the concept of creativity has evolved alongside humankind as we’ve continued to grow as beings. The ancient Greeks had their own exploration into what it means to be creative. Through the Renaissance, creativity even became something of a philosophical process. In today’s society, we temper creativity and creative expression with intellectual, physiological and sometimes spiritual properties. Creativity wasn’t actually named and recognized as a concept until 1926, when English philosopher Alfred North Whitehead finally denominated it as such. Even so, questions still remained. Creativity was – and is – emotional and impassioned, yet deeply cerebral and impossible to compartmentalize. Is it inherited? Is it a state of mind, or is it a process? Perhaps, most likely, it’s a careful and precise combination of each of these traits. Despite our constant and deepening relationship with creativity, the ability to effectively define it and discern its origins remains elusive. As is often the case when we encounter something that defies description, we’ve begun to define creativity as something akin to divine communication – a spiritual channeling from a source that drives the planet forward, and teaches us an expanded form of self-expression. However, Dr. Charles Limb disagrees with this notion. An MD, professor and Chief of Otology/Neurotology and Skull Base Surgery at the University of California in San Francisco, Dr. Limb is one of many researchers eagerly pursuing the definition behind the concept of creativity. His findings suggest creativity isn’t a whimsical notion – in fact, he believes that the more creativity is practiced, the more prolific each proceeding creative endeavor becomes. So it’s not so much that creativity is a mythical communication as it is a muscle you must exercise, or a habit meant to be cultivated. Dr. Limb is both a musician and surgeon, so his insight into creativity comes from a balanced space of understanding the neurological aspect behind creativity, as well as the mystical mindset that seems to be a hallmark of one’s creative nature. If you’re so inclined, we recommend watching Dr. Limb’s TED Talk – called “Building the Musical Muscle” – for further information on his research and how it correlates with the nature of creativity. But getting back to our point: there are very real parallels between outside-the-box creative ingenuity and the disciplined process needed to turn ideas and possibilities into something tangible. We believe there’s a formula for creative success – and the key ingredients are time, patience and hard work. If you had the ability to ask any one of history’s notable creatives how they achieved and accomplished their most decorated accolades, they’d likely tell you that creativity is part beast, part journey. It can be rigorous and time consuming, gut-wrenchingly painful, and at times, insanity-inducing madness. But in the end, it produces results – and it’s the results that matter. French chemist Louis Pasteur famously stated, “Chance favors the prepared mind.” To disseminate further, that means talent, honed skill and thoughtful research overlap and funnel directly into imaginative leaps and bounds, effectively separating creativity from any other discipline. Mozart also proclaimed that hard work was the most central component to his creative process. All inherent talent aside, the act of creation is an arduous and often lengthy endeavor. The one thing it decidedly is not? Magic. There’s still so much we need to understand about creativity and how it works. But as we continue to research and gain knowledge of our creative minds, it’s important to remain focused on the ultimate goal of being a creative: translating creativity into ideas, ideas into actions, and actions into final products that are groundbreaking and game-changing. It’s this philosophy and approach that drives us at STARMEN, where we continue to learn from and work with our creative minds to their utmost capabilities, and consistently redefine what it means to us to be creative. Creativity doesn’t sleep. Neither do we. 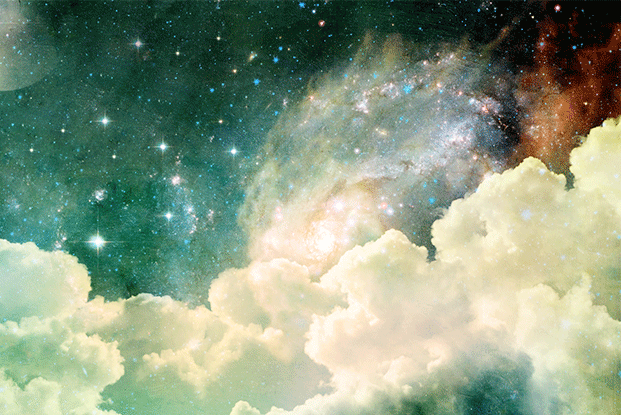 Whether mystical or practical, grounded or ethereal, we’ll continue to explore creativity and its inherent nature in every aspect of what we do. After all, isn’t that what creativity is all about? Author and creative director Paul Arden articulated: “Do not try to win awards. Be true to your subject, and you will be far more likely to create something that is timeless. That's where the true art lies.” Our team at STARMEN agrees fervently with this sentiment from the famed Saatchi and Saatchi alum. Still, while the winning of awards never serves as our primary motivator, we make it a point to pay proper acknowledgement to every single accolade that comes through our firm. We’d be remiss if we did not maintain a sense of gratitude, and we believe this helps us remain firmly rooted in our craft, as well as consistently accountable to each new client endeavor we embark upon. 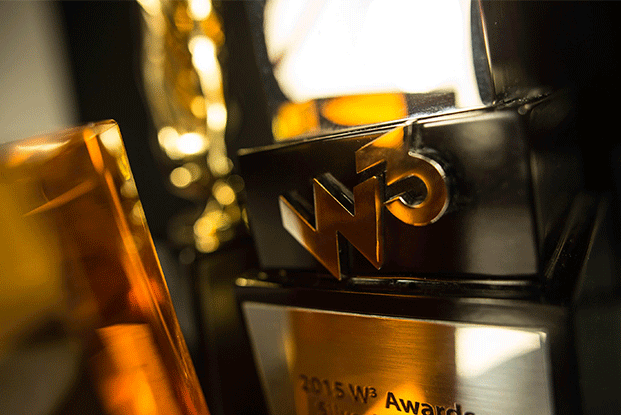 The W³ Awards is one awards program we particularly appreciate. Judged each year by the Academy of Interactive and Visual Arts, the W³ is comprised of the industry’s top-tier professionals, assembled on an invitation-only basis. Judges come from companies and creative firms from all over the world, including Big Spaceship, Condé Nast, Disney, MTV, Wired, and more! Additionally, the W³ is the first awards program of its caliber wherein small agencies and international firms are as likely to win as Fortune 500 companies. By removing team size as a mitigating factor, the judging process is able to focus solely on the work itself, allowing recognition to be fairly attributed to the creative and marketing professionals behind the best videos, sites, and marketing campaigns of the year regardless of where they’re based. This past year, we received two Silver accolades from the W³ Awards for our work with nonprofit LA2DC (www.la2dc.org) in the category of Activism, and for fashion label, KAYAT Design, in the category of Fashion. Submissions in the Website category are judged based on the following components: creativity, usability, navigation, functionality, visual design, and ease of use. Through its rigorous evaluation process, the W³ honors its commitment to recognizing the best of the Web, and we are truly humbled by our inclusion in this year’s cycle. These awards are a true testament to not only the solidity of our team, but the strength of our client partnerships as well. Such recognition is rarely achievable without all components working synchronistically toward their common goal. Long gone are the days when running a really great marketing campaign involved, in sum, brilliant graphic arts and catchy verbiage. Indeed, it used to be that a carefully crafted execution of these two elements could allow marketing executives to sit back, and enjoy the ride. This is no longer the case. Today’s consumers want engagement, and with the emergence of social media, the Internet is an open canvas. Brands that fail to make their mark pay the price in terms of lost engagement with potential customers, and trends show that effectively doing so is increasingly a kinesthetic process -- not a static one. This means that in order to form authentic, long-term engagement with users — the kind that drives referrals, publicity, and sales — your brand strategy must make the shift from storytelling to storydoing. Whether it’s actively acknowledged or not, your company has a story, and denying your marketplace of the insight into that can mean all the difference to your bottomline. As such, we encourage our clients to invest in a strategy that not only divulges what makes their brand unique, but what humanizes them in the minds of human consumers. Beyond engagement, though, the fact of the matter is that you’d be hard pressed to find an industry that wasn’t inundating its consumers with storytelling messages, leaving the buyer to sort through the clutter of verbiage for him or herself. 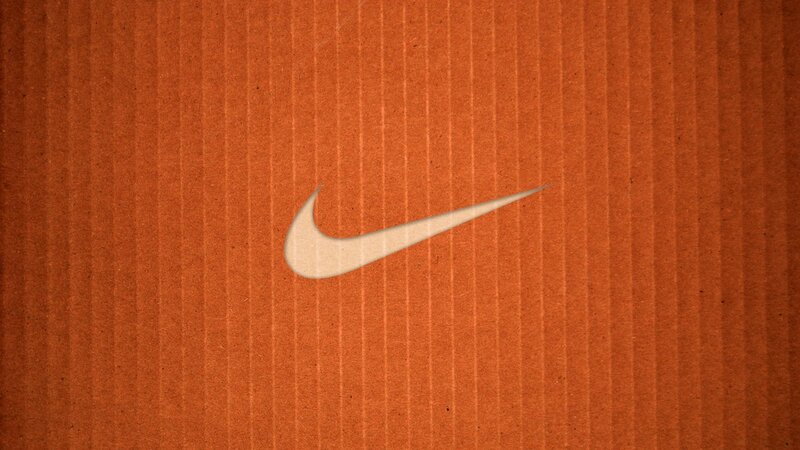 Sports brands tell tales of how their products help you find your inner greatness. Cosmetics brands speak of evoking the most beautiful you. Luxury good brands boast of quality and fine craftsmanship. In the especially gridlocked categories, the only way to truly bypass the noise is to transcend storytelling altogether, and opt for storydoing. 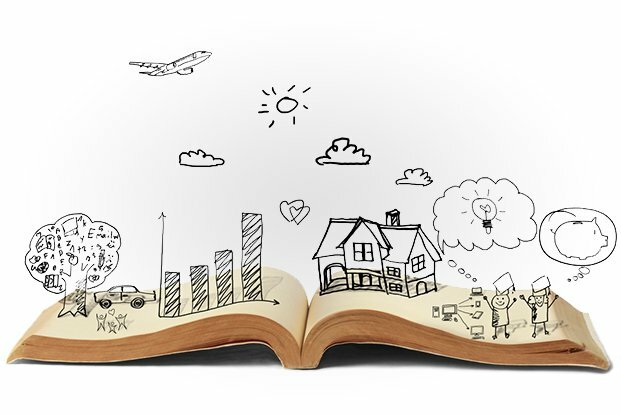 In essence, the art of storytelling has become a more visceral, collaborative practice, and it’s up to you to build out a narrative that encompasses not only your objectives as a company, but the habits, behaviors, and social priorities of your market. Building out the action around your brand — from telling to doing — allows for a shared human experience to be formed with your product at its epicenter. Collective experiences are the foundation of a strong interpersonal relationship, so it makes good sense that it would also be the best way to build a bond with a consumer too, which speaks to the core of human learning patterns. A hands on approach is nearly always preferable, and this extends to all corners of human life. And, in fact, these compelling moments of doing are robust opportunities for engagement not just with immediate audiences, but with consumers far and wide. Thanks to social media, these instances of storydoing are all the more potent as users’ experiences with your brand are projected onto observers at all ends of the earth through Twitter, Instagram and Facebook. Nike’s “Run the World” events, Shell’s Eco-marathons, and Coke’s Happiness Tour are all prime examples of how brands can transition their campaigning from a story being handed down to a tangible engagement with their respective consumers. From these interactions, Nike, Shell, and Coke are able to actually be a living, breathing part of their customers’ lives like never before. What’s more, because events like Nike’s and Shell’s involve an element of achievement — athletes often train for many months to partake in said events — the brands’ potential for assimilation into peoples’ lives is even more enhanced. Most importantly, your company mustn't boast the marketing budgets of a Nike or a Coke in order to make storydoing an excellent avenue through which your strategic and creative campaigns are run. One method through which this can be achieved is by expanding your scope beyond the consumer. By striving to make a truly palpable difference in the world at large, you temper your brand in a way that intertwines elements of human emotion and solidarity. If there’s a cause your company supports, evolve your giving practices so that there is room for your market to give along with you. Buy one, give one programs such as those currently run by TOMS or Warby Parker are popular ways that companies marry charity with consumer activity, and both have proven that a sense of global responsibility speaks volumes in the minds of increasingly conscious consumers. Our key takeaway can be reduced to three words — experience trumps instruction — and this can be rightly applied to nearly any walk of life. Take musician Ed Sheeran who spent years playing small gigs at any venue that would host him before finally making it big, and compare his story of cold, hard do-ing to that of a contestant on American Idol who is simply told they’re a star. Ed Sheeran and other entrepreneurs, artists, and visionaries who’ve risen to prominence after paying their dues can all attest to one thing: building a successful enterprise is a marathon, not a track meet. Ultimately, in order to build that long-term connection with your consumers, you must be in it for the long haul. We promise you, though, that if you stay true to your branding mission, you’ll reap what you sow in terms of engagement and loyalty from consumers for generations to come. © 2019 STARMEN Design Group, Inc. All Rights Reserved.